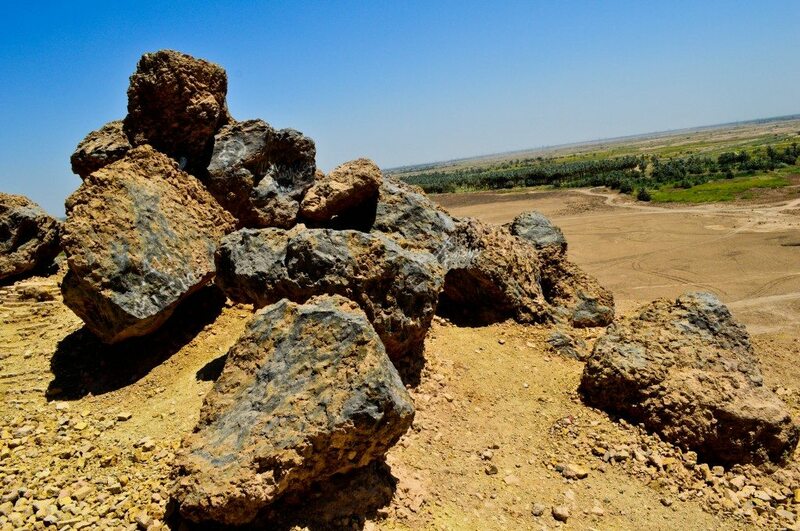 Borsippa lies about 11 miles southwest of the ancient city of Babylon. It is a Sumero-Akkadian city and was built on either side of river Euphrates. It lies within modern-day Babel Governorate, Iraq. There is a road, which takes you directly near the city. It is not a desert. The modern-day name of the city is Birs-Nimrud (Arabic: برس نمرود). Local people think/thought that this is the place where king Nimrod ordered the burning of Prophet Abraham. A nearby shrine can be found and is linked to Prophet Abraham. 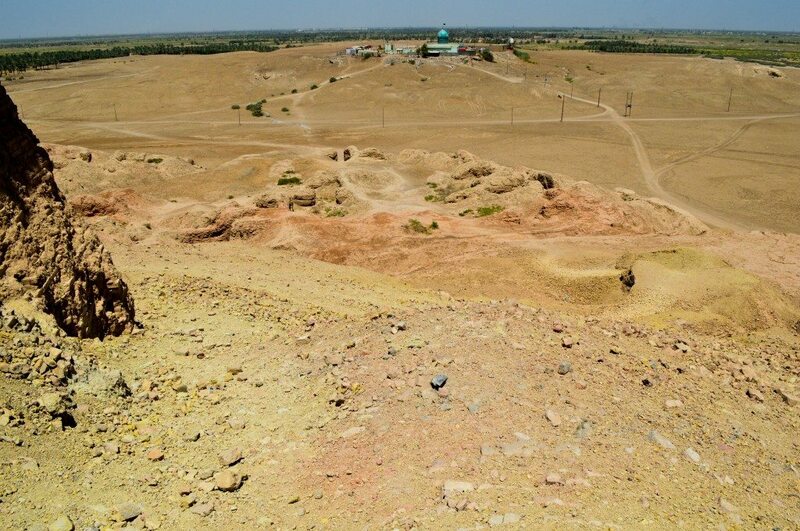 The city of Borsippa is marked by this survived ziggurat and temple of God Nabu. The so-called tongue tower lies on the top. 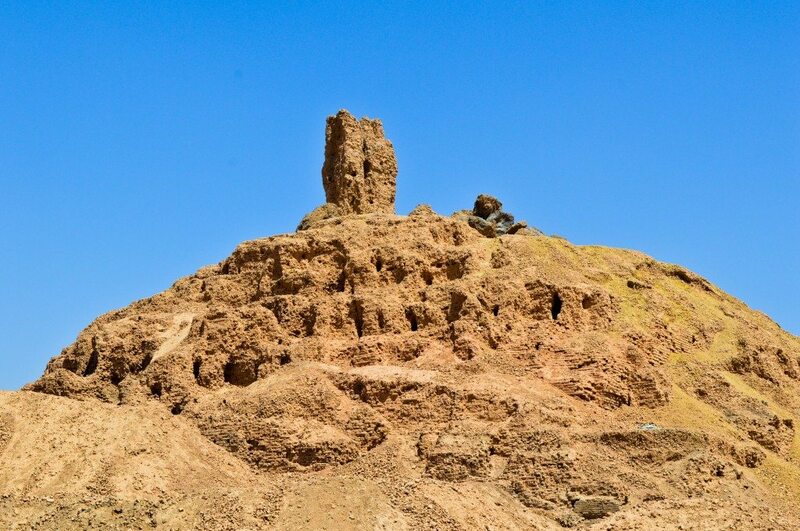 People thought that these are the ruins of the Tower of Babylon. Photo © Osama S. M. Amin. 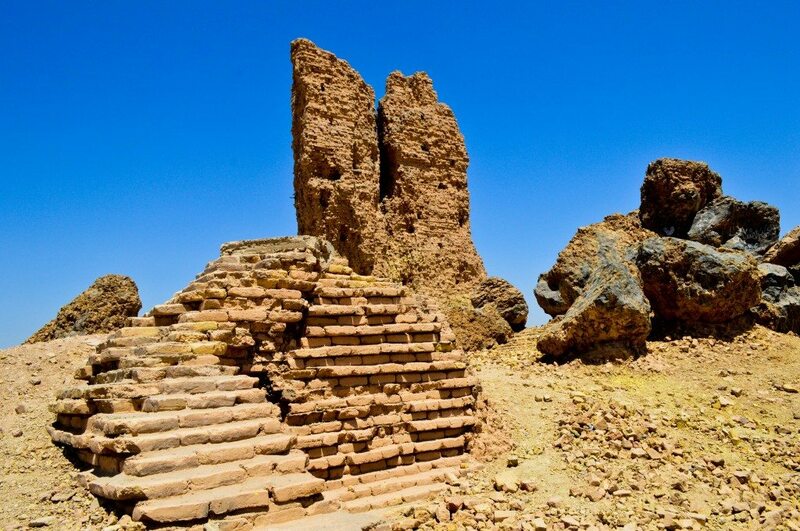 The ziggurat (and its Temple of God Nabu as well the tongue tower) and some buildings’ ruins have survived. Nabu was the son of the supreme Babylonian God, Marduk. Initially, and during the reign of king Hamurabi (1792-1750 BCE), the temple of Ezida at Borsippa was dedicated to king Marduk, himself. The area is flat and is not surrounded by a fence! There were no guards either. I ascended gradually to the top of the ziggurat, moved around all of its aspects, and then descended. It stands more than 170 feet (52 meters) above the plain. I walked around the whole area. Large blocks of molded/melted bricks were on the top of the ziggurat and the area around it. Broken mud-bricks (some were stamped with cuneiform inscriptions) cover the entire area in fact; my cousin calls it a mud-brick factory! 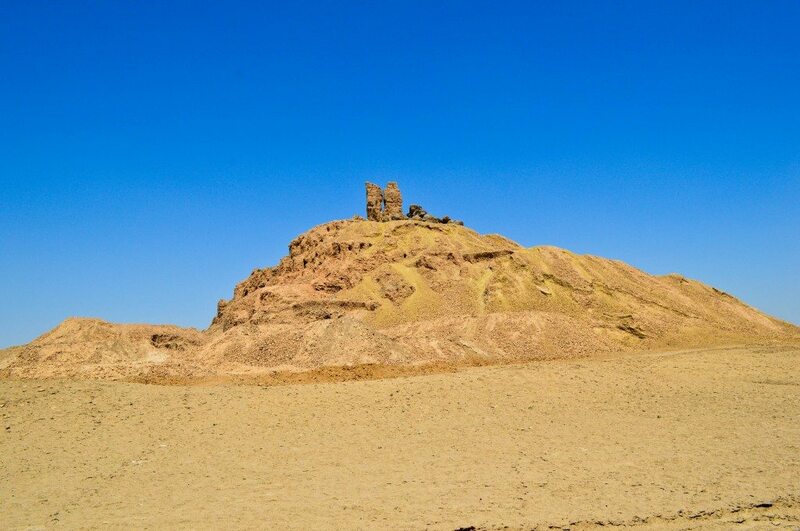 The ruins of the ziggurat and temple of Nabu at Borsippa. The hallmark of this place is the tongue tower on its peak. In 1902 CE, the German archeologist Robert Koldewey excavated the ziggurat. Photo © Osama S. M. Amin. The city of Borsippa was mentioned in several uncovered texts, from Ur III (2112-2004 BCE) to the early Islamic period (9th century CE). Although it was a relatively large city, it never became an independent regional power; it was always dependent on its nearby bigger sister-city, Babylon. 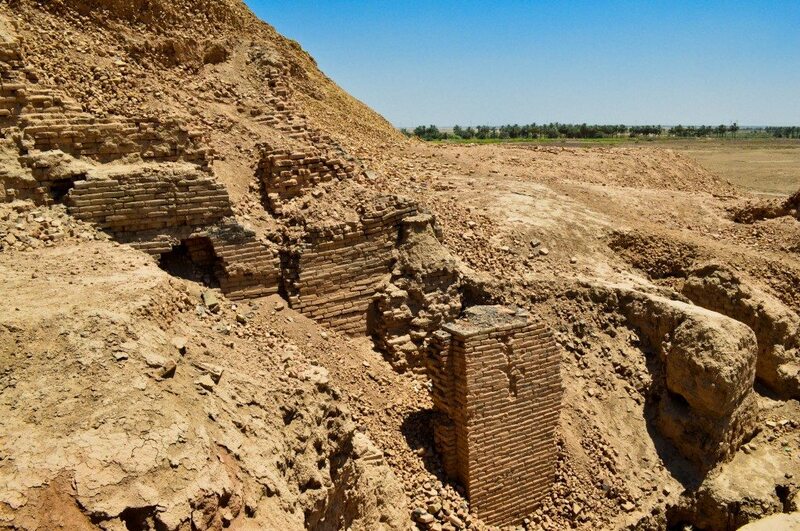 Many artifacts were excavated which had mentioned that the Neo-Babylonian king Nebuchadnezzar II (reigned 605-562 BCE) restored the temple of Nabu and that the ziggurat would reach the sky, thereafter. The temple of Nabu was destroyed by the Achaemenid king Xerxes while suppressing a revolt in the year 484 BCE. The scene of the ziggurat is breathtaking and the scent of the history is euphoria-inducing! You can also read about my visits to other sites in Iraq: Babylon. These fragmented mud-bricks are scattered everywhere! Many of these had been stamped with cuneiform inscriptions. Photo © Osama S. M. Amin. Underneath the mud which covers these bricks, this snow white line is found. 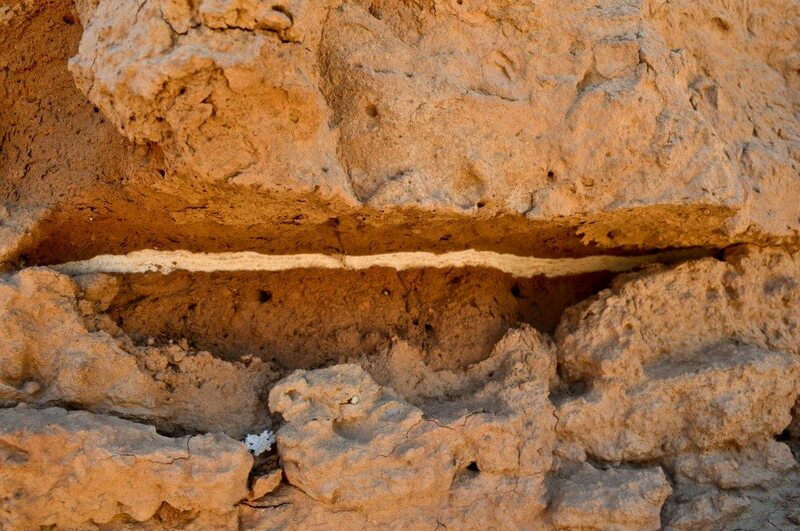 It looks like gypsum which was used to conjoin different layers of mud-bricks. Photo © Osama S. M. Amin. 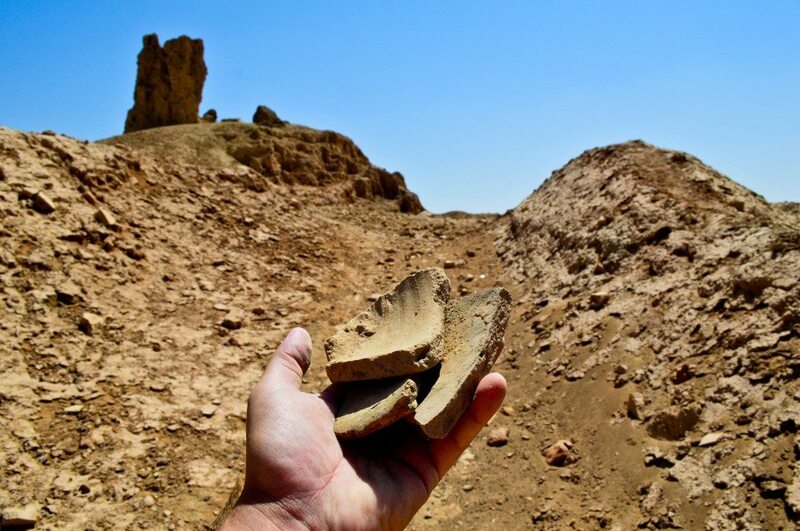 Fragments of a pottery jar; an aftermath of looters attempts to uncover artefacts and sell them. 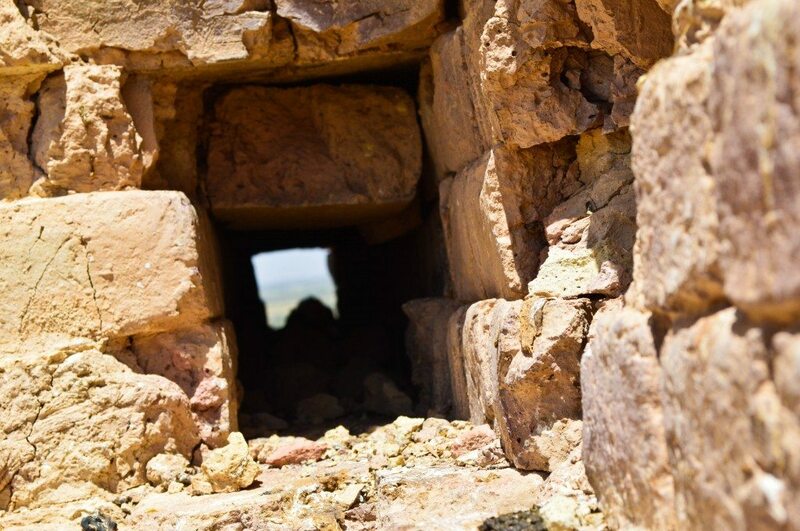 Illegal excavations have targeted several archaeological sites in Iraq. Photo © Osama S. M. Amin. A view into the ziggurat’s foundation. Farm fields also appear, far from the ziggurat. Photo © Osama S. M. Amin. Shooting from the top of the ziggurat. The shrine of Prophet Abraham appears. Photo © Osama S. M. Amin. Now, I have reached the top surface of the ziggurat’s ruins. We can see the tongue tower, conglomerates of melted/broken bricks and bitumen, and a ruin of small altar-like structure. Photo © Osama S. M. Amin. The tongue tower is the hallmark of the ziggurat. It is a single structure that has been cracked into to 2 parts. 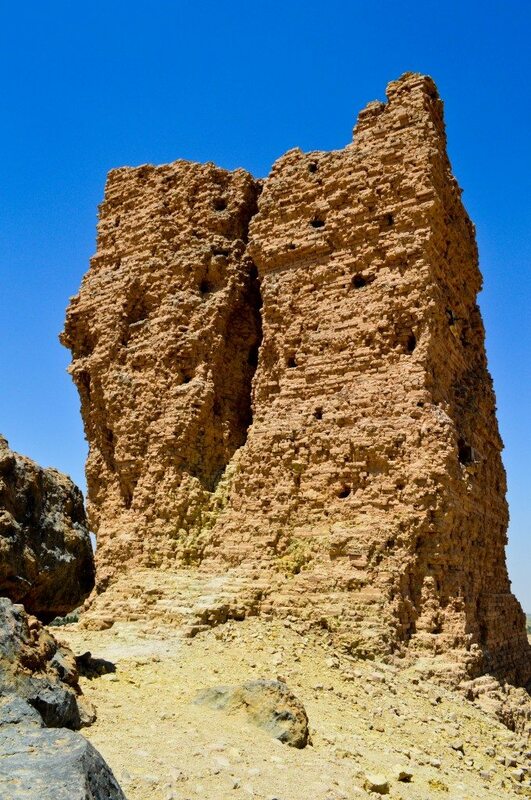 Initially, this was thought to be the legendary Tower of Babylon. Photo © Osama S. M. Amin. 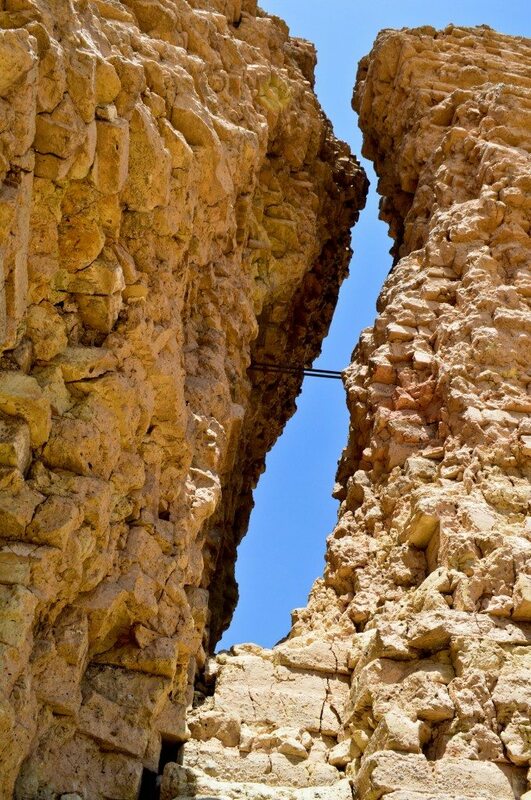 The 2 adjacent parts of the tongue tower have been joined together (to prevent further cracking and collapsing) by iron bars, which pass through the tower at 2 levels. Photo © Osama S. M. Amin. I found this human-made defect in the tongue tower. It might have been made as part of the anti-collapse plan? Photo © Osama S. M. Amin. 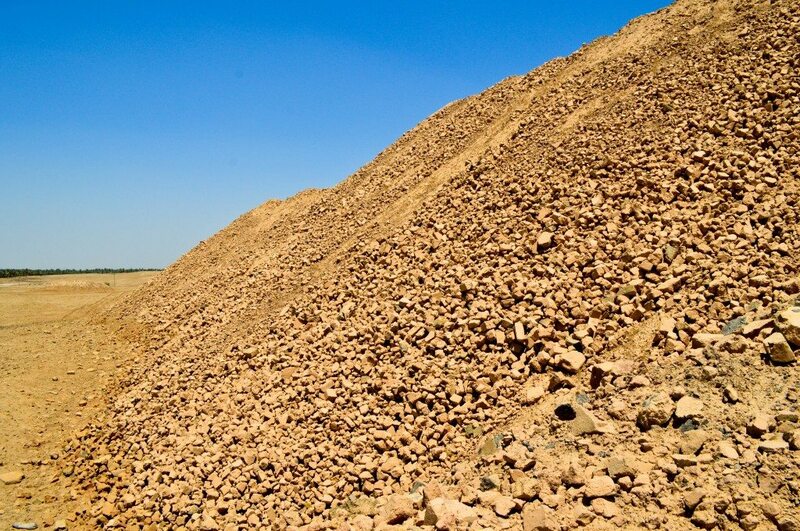 These large rock-like conglomerates of mud-bricks, bitumen and reed, are likely the result of a hot fire and subsequent combustion. The ziggurat was destroyed deliberately by the Achaemenid king Xerxes in 484 BCE. Several of these rock-like structures can be found on the top surface of the ziggurat as well as the surrounding areas. Photo © Osama S. M. Amin. 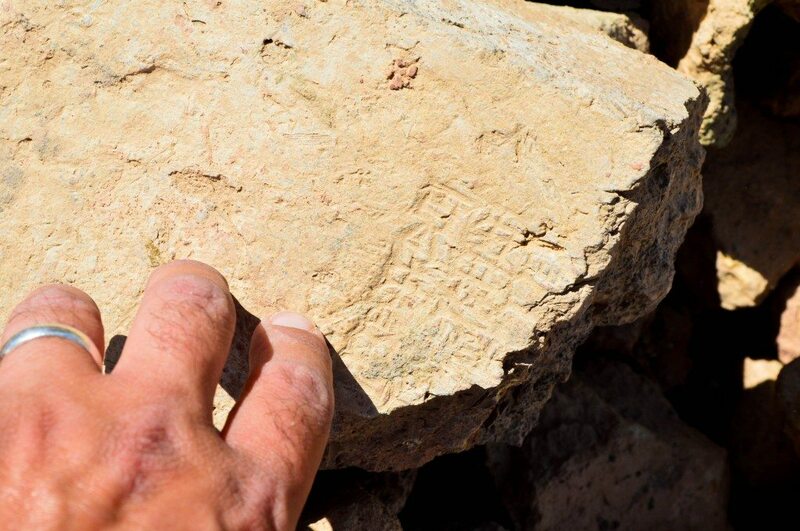 A fragment of a mud-brick which was stamped with cuneiform inscriptions. My left fingers touch and feel the brick! Awesome! Photo © Osama S. M. Amin.